I don’t know about you, but when someone mentions a rainforest, I think of the Amazon. I don’t think if Washington State. We went for a one day trip up to Ocean Shores and realized there wasn’t much to do there other than the beach. I know, what do I expect with the name? We wanted to go to the beach, and we did for about an hour, but it was cloudy and the water is freezing. Not something any of us really want to swim in without a wet suit. Kudos to anyone who can. However our little one loved picking up sea shells. Not all was lost for that part of the trip. Next we decided to travel up to the lake, which is another hour drive, but Caleigh fell asleep and it was the perfect opportunity. If you are looking for a nice area for a longer vacation, Quinault is perfect. 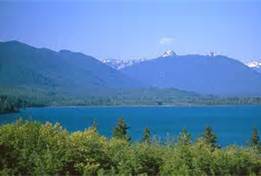 Quinault lake, which the town is centered around is breath-taking! If I knew where my husband’s phone was, I would post the panoramic picture he took of the lake. Absolutely perfect. Beyond the lake, surrounding the town is the rainforest. This is something we’ll explore when I’m not pregnant because I’m not sure how long the hike would be or how difficult. Nevertheless it is now on my list of to-dos. 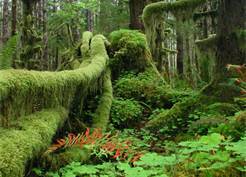 Just to let you know, a temperature rainforest (like Olympic national rainforest) is defined as a rainforest because it has over 55 inches of rain a year and a medium annual temperature between 39 and 54 degrees Fahrenheit. Sometimes it is also that the closed canopy of trees excludes at least 70% of the sky. 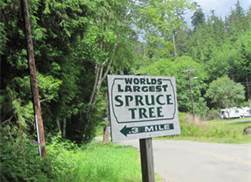 One thing we did do was see the world’s tallest spruce tree. I promise I’ll post this picture later today. It’s better to see the tree with people in front of it, so that you can see how big it actually is. I wish we had more time to spend there, but 4th of July weekend is not the time to try to find somewhere to stay. Everywhere close was booked, but to tell you the truth, we didn’t really want to spend $150+ on a room. *note: these pictures were pulled from the internet. This entry was posted in Uncategorized and tagged annual temperature, degrees fahrenheit, fishing, ocean shores, quinault, quinault lake, sea shells, swimming, temperature rainforest, vacation, Washington, wet suit, world's largest spruce tree. Bookmark the permalink.